Welcome to my seventy-eighth "segment" of my Tuesday's Truths series which happens to coincide with the first Tuesday in the month of April. In the United States of America, this month is considered to be National Gardening and Lawn Month. A gardening related web-page states "Every April communities, organizations, and individuals nationwide celebrate gardening during National Garden Month. Gardeners know, and research confirms, that nurturing plants is good for us: attitudes toward health and nutrition improve, kids perform better at school, and community spirit grows. Join the celebration and help to make America a greener, healthier, more livable place!" Gardeners are not the only ones who improve the quality of their lives by spending time in their garden. 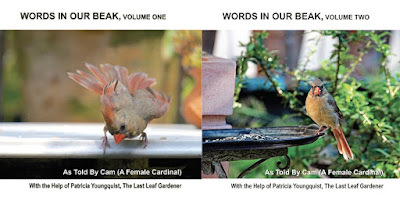 Wild birds, such as Cam the cardinal who visits my rooftop garden also know the benefits of "hanging out" in a garden. She shares many of the benefits re spending time in a garden throughout both volumes of her book series, Words In Our Beak. (their covers can be seen in the image atop this entry). Volume two is relatively new to the market, and while it is a book that people will enjoy at anytime, I think that National Lawn and Garden Month is a perfect time to read it. 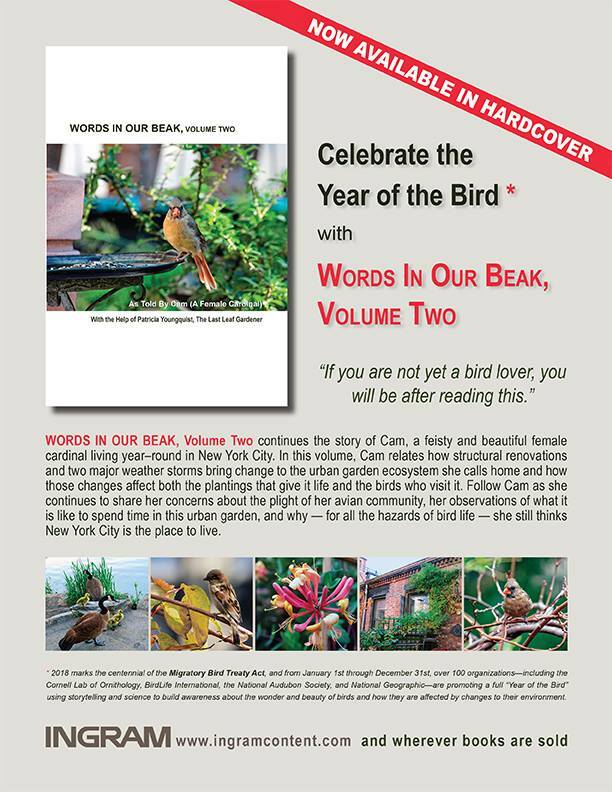 This is because (as the press release* states) in volume two, "... Cam relates how structural renovations and two major weather storms bring change to the urban garden ecosystem she calls home and how those changes affect both the plantings that give it life and the birds who visit it." *This press release was created by Chris Deatherage. 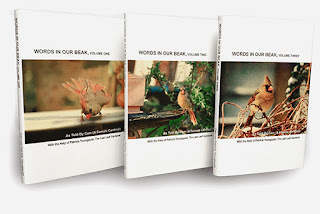 As you may recall (from previous posts), he is the one that formatted and edited both versions of Words In Our Beak. And you may also recall that Chris designed my web-site patriciayoungquist.com. He has updated the site with great information re the book series and I highly recommend that you take a look at it. April 2018's Last Day: Was T.S. Eliot right? "For the beauty of the earth..."
Earth Day Eve: I met my ninth new bird! Tuesday's Truths WK 79: It's N'tl Siblings Day! Rainy Days are FOR THE BIRDS!